It's a great moment in burger history: the first book review by AMANDA, the latest in a long line of lovely teen reviewers (well, actually the line is rather short, but quite distinguished). She is 16 and a passionate reader who dreams of becoming a writer herself one day....and we are just completely happy to be posting her reviews. So here's the first one....take it away, Amanda! 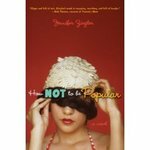 How NOT to Be Popular is a new, fantastic book by Jennifer Ziegler that is hysterical and fast-paced, with unique and kooky characters and situations. It’s a fresh take on high school and a reinvention of the typical young adult themes of how to become popular and be the alpha dog of the school. It’s about a girl named Maggie, whose real name is Sugar Magnolia (no, I’m not kidding), whose hippie nomad parents make her move away from her boyfriend and friends in Portland, Oregon to a new home in Austin, Texas. The title of the book comes from Maggie’s plan to not be popular at her new school, so that when she leaves shortly, it won’t be as painful and hard to do. This book is a truly fun and entertaining story full of laughs, heartache, and ugly clothes. 1. Write about zany characters with equally weird names and situations. Example: Sugar Magnolia, a love child of hippie parents, Rosie and Les. Rosie and Les like to study astrology, herbs, and befriend any stranger they meet on the side of the road. They also like to experience life and move every 8 months. Oh, and walk around naked. 2. Make the story relatable, but still very creative. Example: After Maggie comes up with her great big unpopular plan, she falls in with a bunch of “losers” (or so she initially thinks), with a love for helping the community. She meets a “Young Republican” named Jack, and starts to feel genuine feelings for him. While this whole storyline is something that many teenagers probably haven’t gone through, many have feelings for people they don’t want to, or people who they initially think are too opposite of them. Many teenagers can identify with Maggie’s thoughts and opinions, while still being entertained by the craziness of her life. 3. Write in a new and different format, that foreshadows the events of the next chapter. Example: Ziegler writes the story in chapters that are titled according to a list of how to not be popular and feature tips on how to achieve the unpopularity quotient. These tips tell what’s to come in the next few pages, and are really fun to read and predict what’s next for Maggie in her quest. My favorites are: Chapter Two’s “In order to be unpopular, you must look the part. Remember four words: “plastic flowered swim cap”and “Unpopularity is a state of mind. Feel Nerdy, It also helps to use the word vaginal a lot.” Yeah, this book is just that funny. So run out and get this book, How NOT to Be Popular by Jennifer Ziegler. After you lend your friends the book, you’ll sure to be the most popular girl around. Trust me.